Our company has a Level VI (6) CVSA classification and is consistently rated in the top 1% of North America’s carriers for safety. It is a record we are extremely proud of. We keep the public, our drivers and the personnel that handle our sensitive cargo safe from harm…always. This takes a combination of strict policies and procedures for every step of the journey. 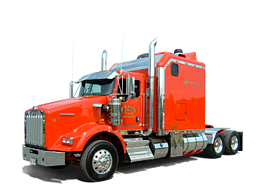 It starts with employing the best drivers, with excellent driving skills and then adding the specialized training to be certified to haul radioactive and hazardous materials in Canada and the USA of all descriptions. In tandem with having the right person behind the wheel, we ensure our equipment they are driving is in top notch condition and our cargo is packaged and secured to ensure a safe journey. Home | Site Map | Copyright © Jade Transportation Services. All rights reserved.